Thread: Shoeless GTM #501 Here we go!!! Well, now is as good as time as any. My name is Sean Jackson, I live in Palm City Florida, I am an Aerospace Engineering by trade, turned Program Manager and I work at Pratt & Whitney. I took delivery of GTM #501 on 10/3 and am very excited to join this group of talented builders. I have spoken to a couple of you over the phone, and a few messages here and there to get some general guidance, so thank you so far and thank you in advance for the many questions I’m sure I will be posting here. Here are my plans so far, and please anybody jump in if you see something that doesn’t add up. - LS3 427 From Blue Print Engines. I have been working with Johnny there so far and he is eager to help power a GTM as they mostly do motors for the MkIVs. He is offering some very nice incentives to have me work with him and I am very happy so far. - Infinity AEM Engine Management System (one main selling point is adding traction control that this system provides and I love the idea of being able to integrate a tablet in the car to do any tuning on the fly). - Mendy Transaxle – Glad I ordered this a while ago as there is a 5-6 month lead time when I ordered. - Some derivation of Tino’s Procision set up. - Infinity Box Setup with all the goodies. - Boyd’s Aluminum Tanks – Still haven’t decided on internal or external fuel pump. - QRP Custom Bilstein Shocks and coil overs and front sway bar. - Kooks fully ceramic coated exhaust. - All kinds of goodies from Shane and others. - Forgestar F14 (19x9 Fronts and 20x12 Rears). I have gone through most of the inventory so far, and I will be honest, I’m a little disappointed in FF service so far. Here’s a couple examples. FFR sent me the carpet and vinyl box after my shipment, but it contained 2 full sets of carpet. They didn’t believe me until I sent them a photo of the 2 full sets laid out on the ground. Plus my exhaust screens are not cut in the same orientation, and I’m told FF can’t do anything about it. I offered if they provide me with a shipping label, I would send them back with the extra carpet in exchange for proper ones, but they didn’t take me up on my offer. I hope this is not what I am in store for with them. 1. 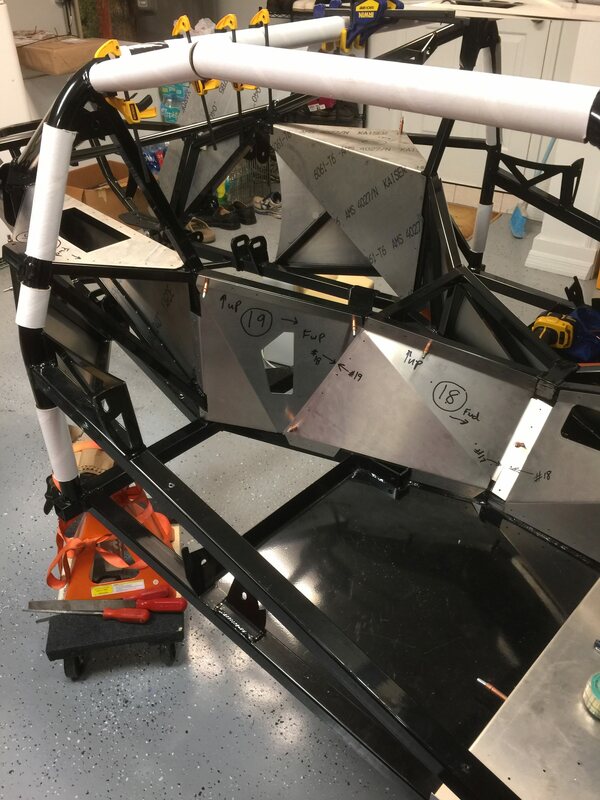 I have gone through all the Aluminum pieces shipped on the frame. I count 30, but the inventory says I’m supposed to have 33. Take a look at the pics and see if you guys can help. I think I have everything up front correctly, so I'm missing something in the middle or rear sections I believe. Plus I don't see the Rear Body Mount anywhere. Not sure where this would have been packaged. 2. 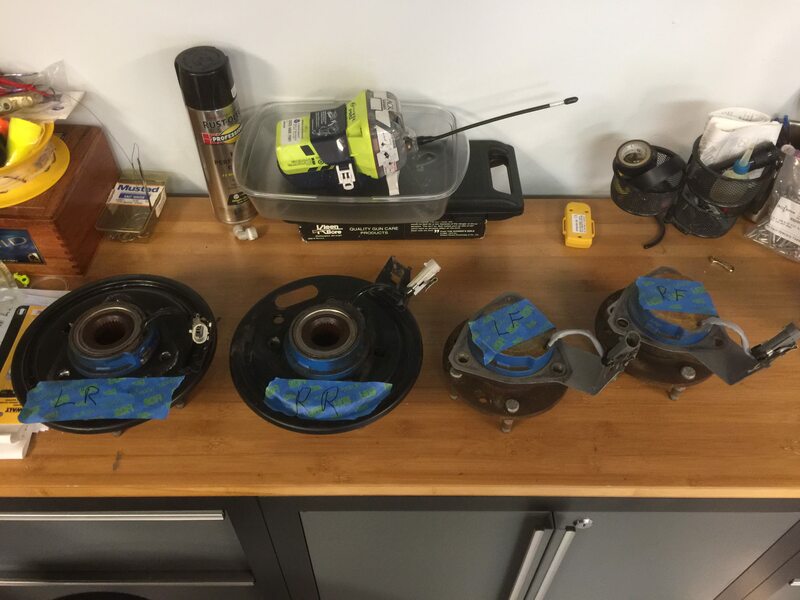 What is your guys preferred fuel pump setup? Internal vs. External? I'd hate the idea of having to remove everything to access the internal tank to change a pump out, but I'm also concerned with real estate in the back. I’d like to get my tanks on order here soon. Last edited by Shoeless; 10-27-2017 at 03:34 PM. Welcome and congratulations on starting your build! 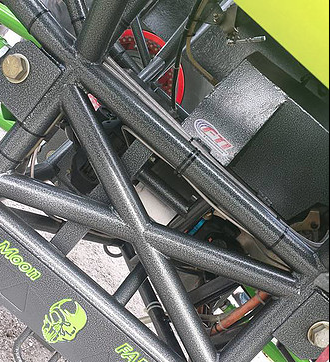 Are you missing the aluminum body supports on the sides of the engine bay like in this picture? If you are referring to the pair (one with the Infinity Box Cell attached) and these were supposed to be attached to the frame from the delivery, then yes, that would account for two of the three I'm missing. 2 down 1 to go, thank you Sir. 1. It's been forever since we've received a virgin kit from FFR, so I don't recall what panels come attached to the chassis and which ones are boxed up separately. 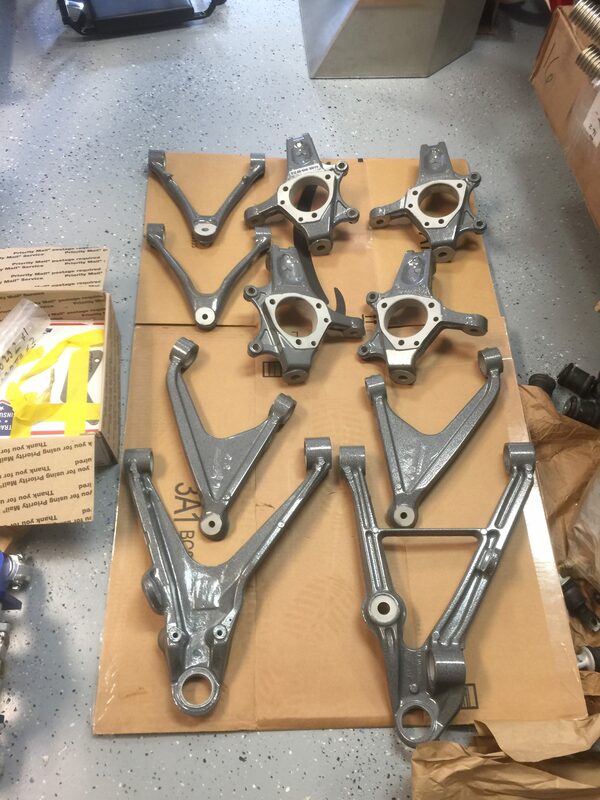 The ones Beeman pointed out above....I don't think those come attached to the chassis. There used to be a large half-moon shaped piece along with a large U-shaped bent piece that fits around the front hood grille opening to funnel air into the radiator, but I don't think FFR ships those parts anymore with the Gen II kits. Sorry I can't be of more help than that. 2. That's a good question. IMO, there are a couple of things to consider. Real estate is definitely a concern. One thing I would suggest is to NOT mount an external pump up on top of the aluminum panel next to the engine. Fuel pumps were meant to create pressure....not suction.....and I have heard of plenty of people who mounted their pumps up high on that aluminum and then had starting issues since the pump can not pull fuel up that far out of the tank. That means that if you're going to go external, the only real mounting position is to figure out a place for the pump directly behind the tanks . 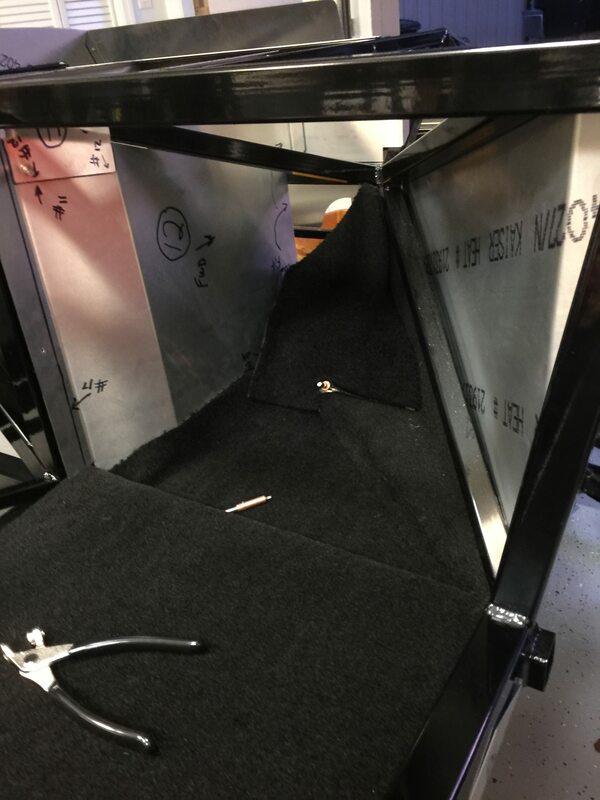 Not a ton of room to work with down there and it gets pretty complicated if you're wanting to us all AN fittings and get a pre-filter and post filter fit in there.....but we have done that a few times. Yes, it would be a bit easier to access the pump there vs having it in the tank. The other issue is noise. External pumps are generally pretty noisy. Some more than others. Sean welcome to the fun. 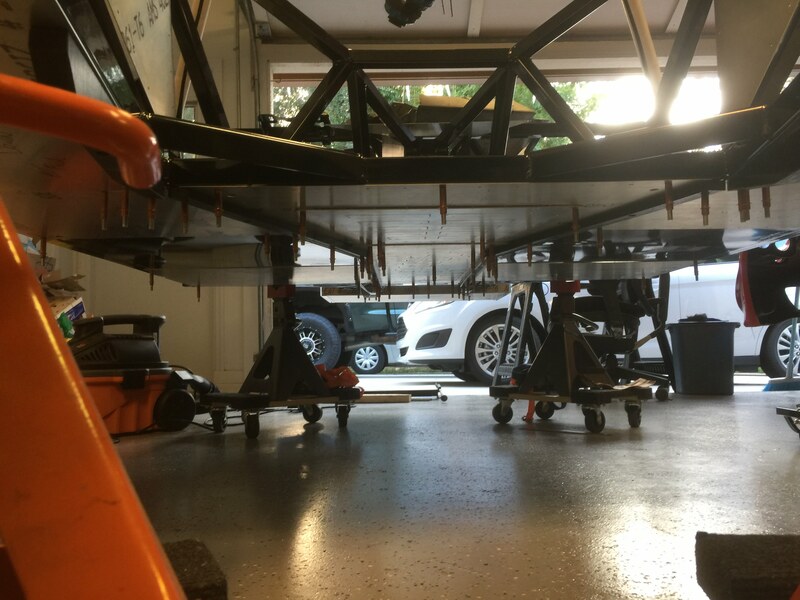 I have GTM 493, have had a good time building lots to look at and plan for as you proceed through the build with lots of help here on the forum. From your pictures I do not see the piece that closes up the front bottom under the radiator. 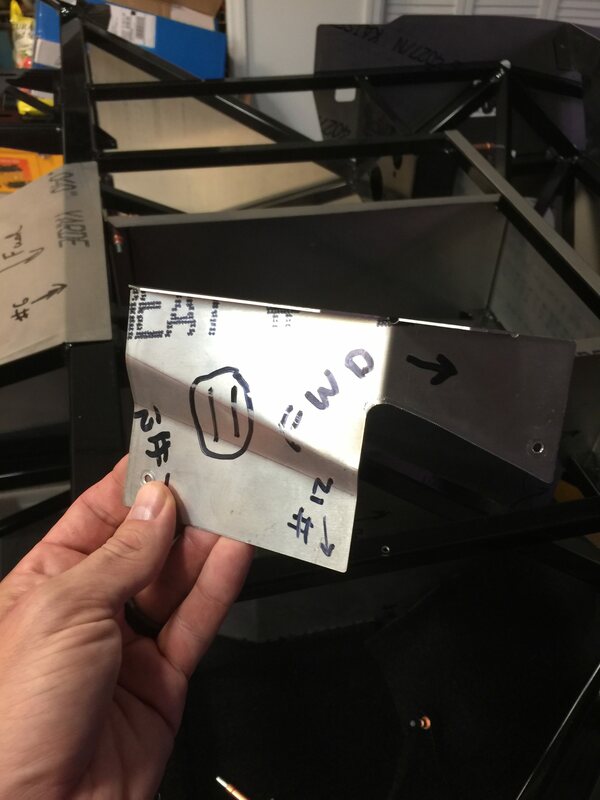 The pieces that Beeman points out should be in another box with the rest of your sheet metal pieces. Do you have the piece that is in the top right of the driver foot box with a hole cut in it for routing your wiring through into the tunnel? I am also waiting on a Mendy so I will say don't hold your breath for the 5 to 6 month lead time. good luck with the build list of items looks good. Your pump(s) should depend on your power goals. One in-tank 340 or 450 should be plenty if you are staying n/a and on pump gas. The internal pumps run cooler and are quieter. I actually have two pumps, one internal on the pass side(corvette driver side) and one mounted externally on pass side. The external pump is on the inside of the panel cubby area directly behind the tank. The cubby area on the other side houses the y fitting for both fuel lines and the return as well as my methanol pump and tank. My external pump is controlled by Holley efi so as to only come on during boost so I don't hear it run all the time. Thanks for the response Shane. I’ve put in some time into planning this out as best I can, but will definitely be relying on the knowledge here. Thanks for the welcome Sir!! I have the front bottom piece that would be below the radiator, it just happened to be on the floor just out of the pic. I’ll check on the drivers footbox when I get home. Thanks for taking a look. Wow that sounds like quite the setup. I’d love to see some pics if you have them. The motor I’m planning on will have a targeted HP of 625 and max torque of around 570. With those numbers any recommendations on fuel pump? So I spent the day organizing the garage a little bit more and getting the frame up on jack stands and furniture movers to make it easier to move around the garage. After that I turned my focus towards removing the screws and looking at the fit up in the passenger footbox as it didn’t seem quite right. After playing around a bit, I will surely need some more attention in this area before I remove all the panels for drilling and coating. Unless I’m missing something, it just all seems way off when put together at the factory. That's a fairly common issue. You will want to go thru and "massage" the panels into the best position before you go drilling holes in them. Issues like the one in your photo will probably require some "modifications" to get the fit right. 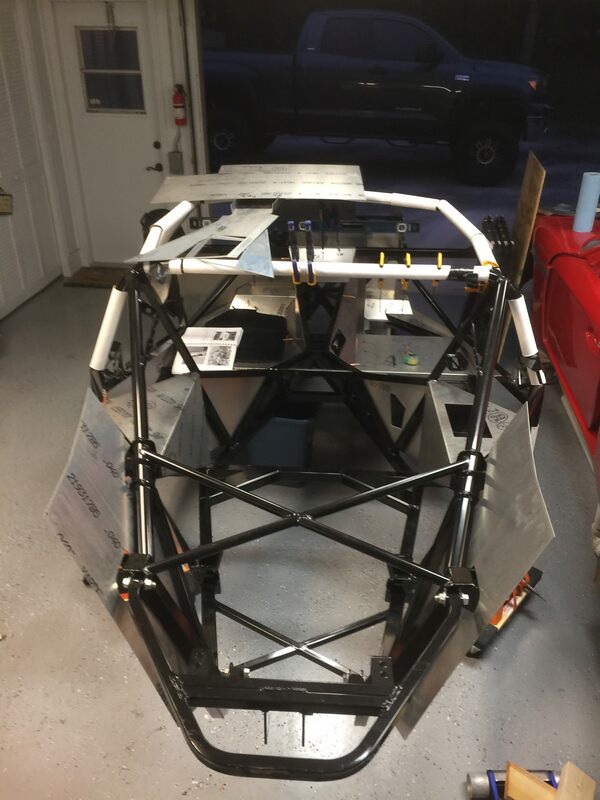 As for coating the panels, if you're talking about powdercoating them, I would not powdercoat the interior panels.....they all get covered anyway, so not much sense in spending all that time and money prepping and powdercoating them when no one will see them on the finished car. 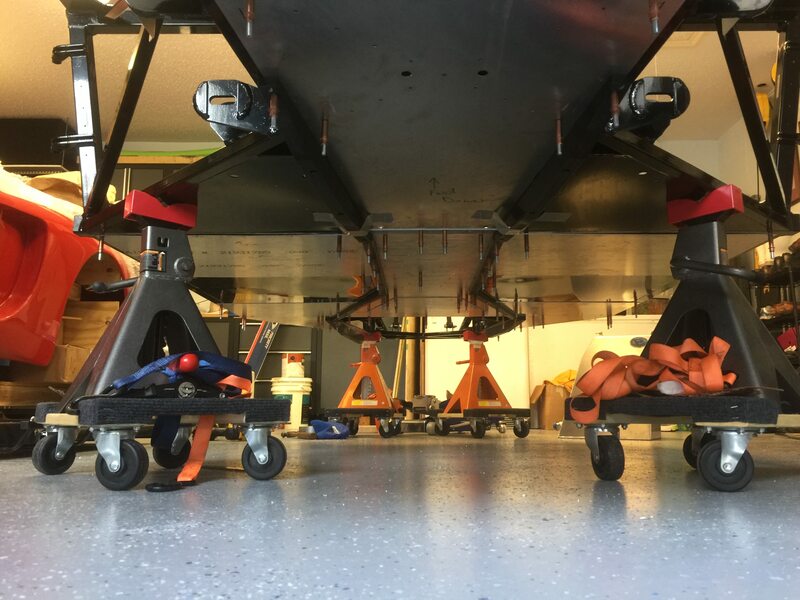 Besides that, I've seen plenty of the powdercoating fail on aluminum panels here (falls off in big sheets)....which means if you have that problem on the interior panels after you get your carpet and vinyl installed, all of that stuff will fall off. I got my Kooks refund check in the mail on Saturday, I’m glad a few more guys showed up to the party. Thanks for sending that out. After stairing at everything last night for an hour or so and removing the panels and trying to install per the manual, you are spot on, looks like some “massaging” is in order before I start drilling. 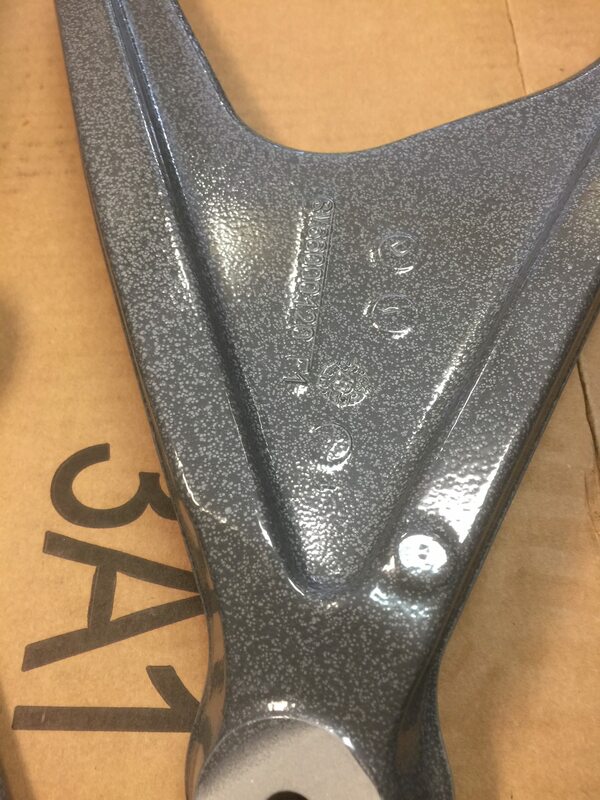 As for coating I remember seeing guys have issues with powder coating panels. My plan is to coat the majority of the panels with lizard skin, any heat affected areas will get the ceramic top coating, and any wheel well or bottom panels will get a bed liner type product. I’m probably erroring on the safe side as I live in S Florida and about 10 minutes to the beach so the salt air really gets to things. As I have mentioned quite a few times, if you are looking for a really durable finish for the aluminum panels...have them anodized. It also makes for a great base for paint, glue, etc. Sorry if the photos are too large. I'm still working around the damn Photobucket crap. I'm not paying $400 a year to use them again. What hosting service or posting method are you guys using that is more user friendly? I am back from my business trip to San Diego and finally got some more time working on the passenger footbox fit up. I started working on my panel #11. I believe the formal name is the passenger footbox closeout. I was having major issues so I started here. I needed two separate bends at different angles. I like the way it turned out. I then moved over to the right side of the passenger footbox. I needed to trip panel #14 to get things to fit up nicely. Now there is a small mismatch on the bottom right corner, but there is plenty of material here for the overlap. 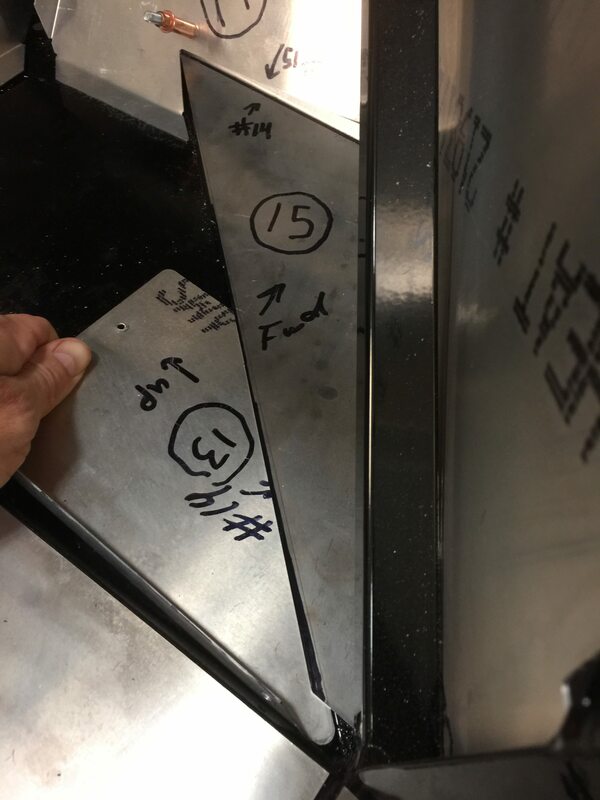 In order for me to get the right side panel of the passenger footbox to site nicely, I'll have to trim panel #15 where the black marker is (panel #13 is there just as contrast to show where I’ll trim #15). This will allow the right side panel to fit nicely against the square tubing. I figured I would lay the carpet in there just as a sanity check to make sure I am not doing something stupid. So far, I’m pretty happy with the fit up after all the “massaging” of the panels. So I have been fairly productive between work and Thanksgiving. I have the majority of the sheet metal all fitted, drilled, and ready for coating. My only issue is this darn passenger foot box. Nothing special in these first couple pics, just progress so far. Here is the passenger foot box. It seems my panel 12 needs to be longer and taller to fit all the areas it will be riveted properly. On the forward edge and top edge I needed to add a 1/8 spacer of aluminum and on the bottom edge I needed to add 1/4 spacer of aluminum just to get everything to line up properly. 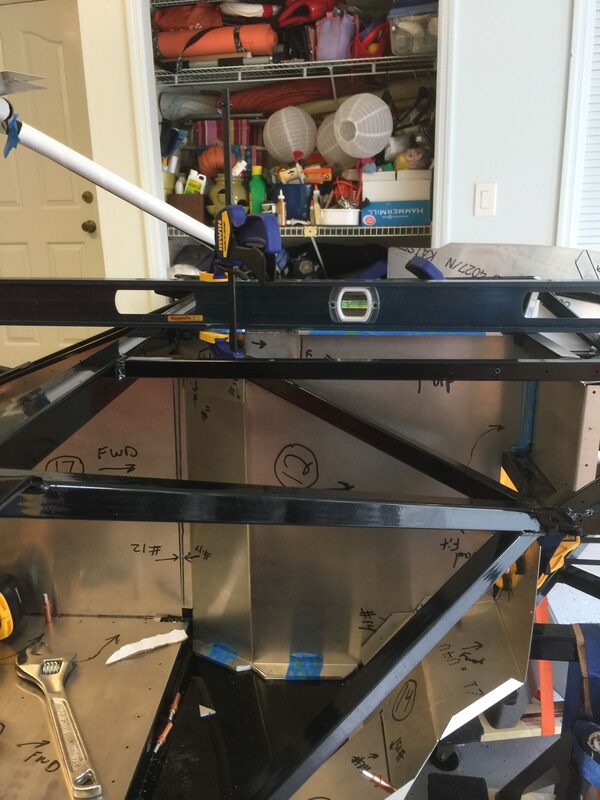 Without the spacers on the top and bottom, it will not rest flush with the top where it is riveted in the future with the top closeout panel, and will not rest flush on the floor. Similar with the spacer on the front edge, without it, it will not rest flush on the front piece of aluminum. I then needed to trim my panel 14 where the small orange clamps are so the edge is flush with the diagonal square tube. I’m a little hesitant to start drilling and make it more permanent as I’m waiting on Shane’s AC Blower Relocation Panels that I know will interact with these parts. If you are installing A/C your are doing yourself a big favor buying the recirc kit from Vraptor. Just my 2 cents worth. Depends on how OCD you are Shoeless. No one is ever going to see that area, so you can patch it or silicone it. 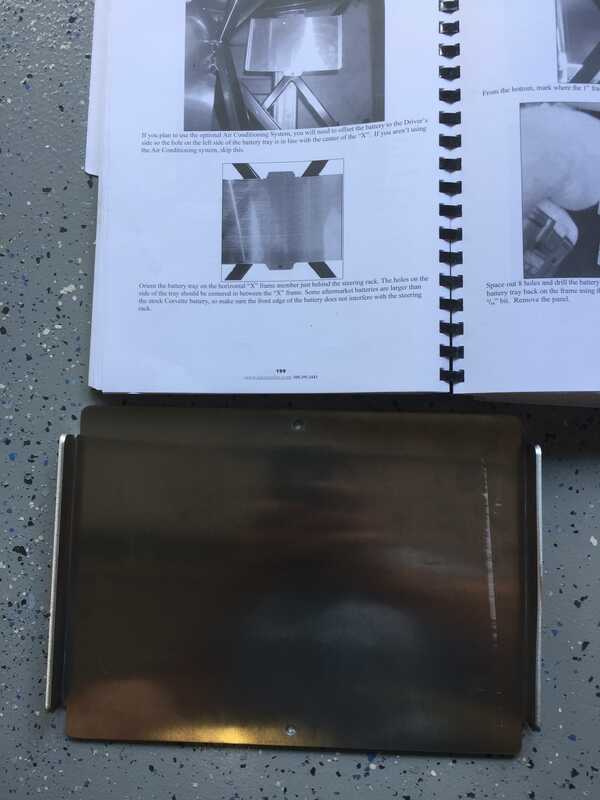 If you want to redo the panel, buy some sheet aluminum from Aircraft Spruce and make a new one. I bought some sheets from them last year for making my own panels, it was relatively cheap even with shipping. If you were close by I'd give you one. Yea I’m pretty OCD, but more on the side of functionality. I’m just concerned that by trimming and spacing things, I may screw up some fitment/function down the path that I’m not accounting for at the moment. I like the idea of getting some new sheets and making my own replacements. I’m picking up the front close out panel from Shane as well as I’m moving the coolant tank to the rear. Maybe I’ll take the current panel from the kit and play around with it and see if I can make a replacement out of that just as a test panel. BTW, what are you guys using to seal the panels to the frame and close up gaps? I’m not sure I want to go down the path of silicone, as I’m sure there is something better out there. IMO the GE black silicone is the best. It fill gaps and is not very noticeable against the black frame. Thanks Tom!! I wish I could have seen you finish off your first GTM build, you were making fast progress. You don't waste time getting at it! Congrats again! OK I need to vent a bit. So I finished up my inventory some time ago and sent a nicely organized list off to FF to start working on the missing items. Here starts the issue. I was missing a number of items, but I'll hit the highlights. I was missing all carpet and vinyl pieces, and then received a box with two full sets of carpet. I call FF telling them I was sent two sets of carpet and no vinyl. They were very sure they sent a carpet and vinyl set properly. Only when I laid out the two sets of carpet, took a photo, and sent it to them did they agree to send me the missing vinyl pieces that were originally on the first shortage list I sent them. Then I come home from a business trip and I have an entire ADDITIONAL box 13E show up. I clearly pointed out in my inventory I received this box complete with no shortages. This is the absolute largest, and probably pretty damn pricy Stitched Interior Parts box. Now I have two FULL box 13E and NO vinyl pieces. I call once again, explaining the issue, and they seem dumbfounded and say they need to look into it. I offered if they send me a return shipping label and schedule a pick up, I would get the box back to them. That was about 3-4 weeks ago now and I have heard nothing. So I have blown it off as a complete loss to them as I have done everything I can offer to get them the extra box back with no action on their side. 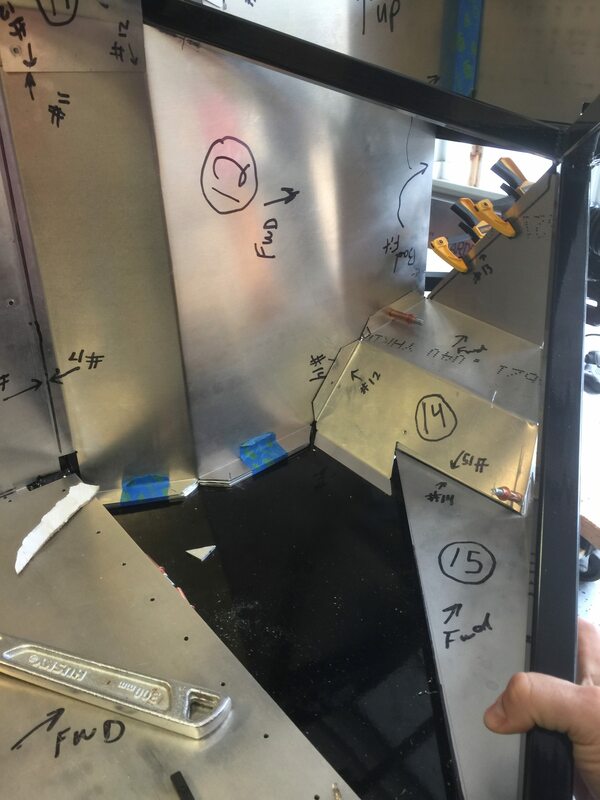 Come to this weekend, I get to a point where I am on hold on the sheetmetal until I get some parts from Shane and make a final go ahead on the passenger foot box compartment. So I grab the battery tray. It says in the manual shift it to the driver side and I notice something that is off. The outside profile is not cutout properly. I call FF asking for a replacement and email the bottom photo. Nope, I'm told to wait til after the HVAC install and then install it. It clearly is not correct, yes I can cut it my darn self, but come on. This build is difficult enough without getting correct parts to start with. I have intentionally left names out of this, but I have been working with one individual through this whole process as recommended by other builders. OK rant over, back to researching parts and continuing the build. If anyone from FF is reading this and would like to discuss further, please PM me and we will discuss. Thanks again Tino, I'm looking forward to integrating your system in my project!!! Last edited by carbon fiber; 12-06-2017 at 07:47 PM. I have to assume that FFR browses this forum daily, it is after all their forum, but I only see promotional posts for the most part. Sorry to hear about your issues. I also had stuff missing but FFR always made good on it. I will say that the GTM is a very difficult build and FFR is planning on retiring it as I overheard one time up there. I tend to not get too caught up in the minor stuff otherwise you can go crazy. Making stuff fit and work is part of every FFR build. To me that is part of the fun in the challenge. I suggest you buy a smaller aftermarket battery vs the corvette one. you will be glad for the extra room. I remember seeing those during my inventory. Cracks all over the bends. I’ll be fabing up a new set as well. I’ve also decided to buy some aluminum sheet and try my hand at fabing up a replacement panel for the passenger foot box. I figure it’s cheap enough to buy one sheet and see what I could do on my own. Although I have limited sheet bending tools, I’m willing to give it a try. I’m too OCD to go forward with it as is. 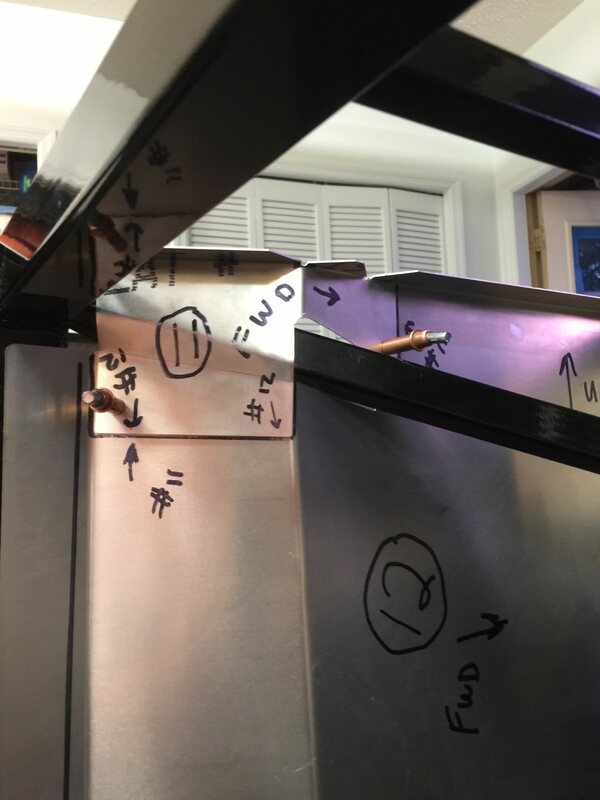 Or make a angled patch piece as I am fairly certain that the gap that you are concerned about will not be seen once all the cover panels are in place. Fabricating new panels is easy due to the thickness as most low cost benders will do a good job. I picked up a cheap bender today and waiting for my aluminum to arrive in the mail. If you look at my post 16, pics 3, 4, and 5, everywhere there is blue painters tape I have had to shim beneath the bent flange of the aluminum to set it properly. Its like FF cut it too short and narrow, and once the tabs were bent it just wouldn't work. 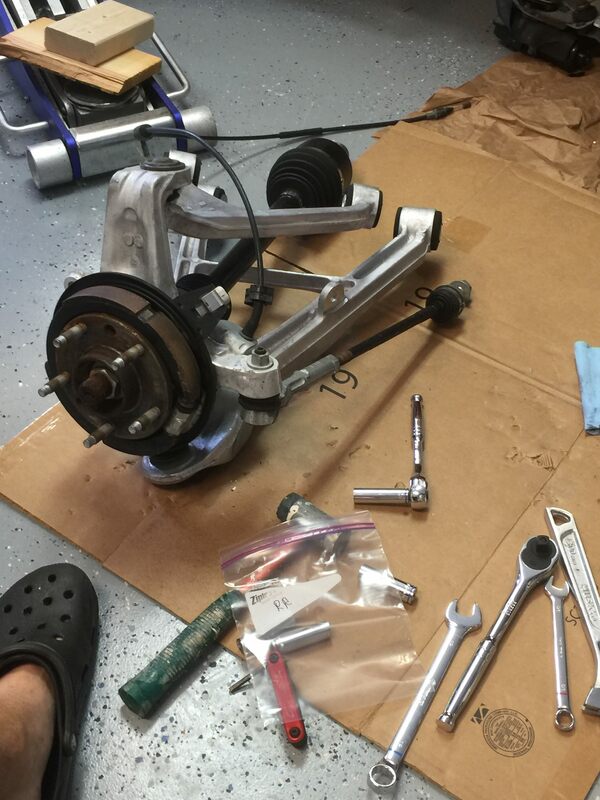 I spent most of the weekend working on tearing down the suspension to get ready for powder coating. I had planned on leaving them as is, but once I started thinking I wanted to replace all the bushings and ball joints, it seemed like a logical next step. Plus, seeing some other builds and how nice they turned out, I decided to do it. I have a local powder coater who did some work on parts for my Tundra and has really stepped up their game in the local area. Years ago they were doing mostly T-Tops for boats and have now expanded their color lines and industries. Below is the color I plan on going with. I’ll be stopping by their shop this week, being slow at work prior to the holidays, and getting some final pricing. Hopefully these guys have worked with cast aluminum. In the mean time I’ll be ordering replacement PFADT bushings and all new ball joints. Last edited by Shoeless; 12-10-2017 at 08:02 PM. I have been making some great progress over the Christmas break and will give a more detailed post towards the end of the year. In the meantime, I got some time on the water with a coworker and his wife, and thought I would share. Its rare to get on the water in the winter time, but we made it out and sent my guests home with plenty of great eats. I see that Infinity Box is giving 17% off any order over $1k before midnight 12/31, perfect timing for me, but the email also states they have been working on some top secrete stuff for 2018. Looks like I'll be placing my order for the items I am looking for my build and take the savings, but I wonder what they are up to with new products. Cool video! looks like FL. I was hoping to get more done over my Christmas Break, but it looks like the cooler weather will hold up my coating efforts. My bed liner product wants 70 deg or higher and lizard skin wants 60 deg or higher and with the forecast not looking so nice, I’m going to put it off a bit. Either way, here’s where I am. 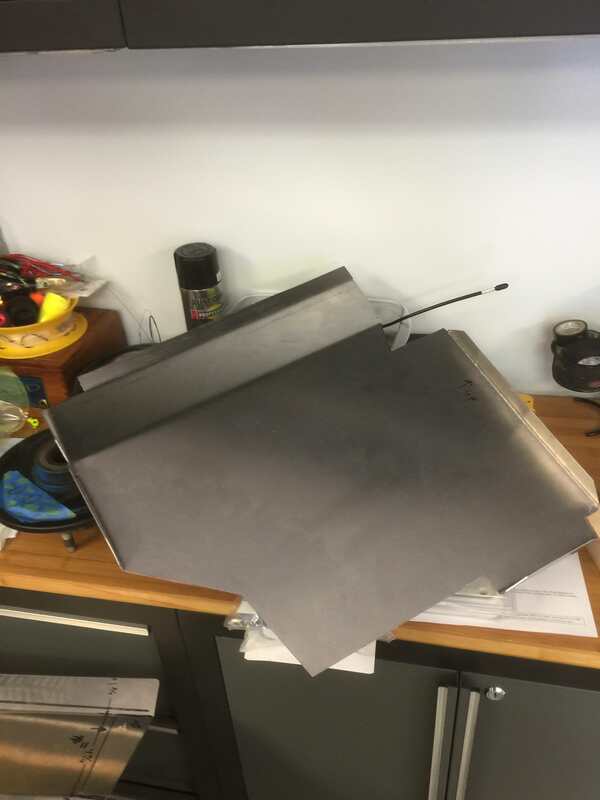 I got a shipment of aluminum sheet metal (to remake the passenger foot box panels that I didn’t like), Boyd Aluminum fuel tanks, and a shipment from Shane in so I have been pretty busy. Here is the panel from FF that I would have had to place shims all the way around to make it fit (blue painters tape holding the shims) and the replacement panel I made from scratch. It fits perfectly, but it did take me a bit to fab it up. My OCD wouldn’t let me use the crappy fitting FF panel. 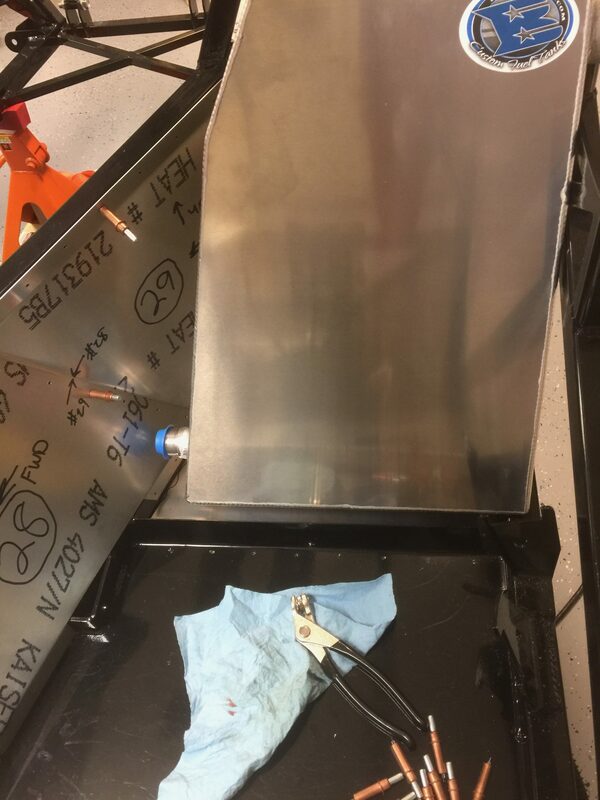 With the shipment from Shane, I bent up the coolant tank close out panel and started working on the belly pan aluminum. I also picked up the skid system from another builder that gave up on his build, so I got a nice deal. Everything fit perfectly. I put all the aluminum panels back in and set the tanks in place in hopes of mocking the area to drill the holes for the crossover tube. It seems like there is no “perfect” spot that the tanks fit, so does anyone have any photos of theirs sitting in place with the crossover drilled in the tunnel aluminum? I’d like to get these as close as possible to their final resting spot before I cut holes in the tunnel aluminum. They basically just get sandwiched in with the tank closeout panels. Most people are just making rubber strips to insulate all around and they are held in by the panels. 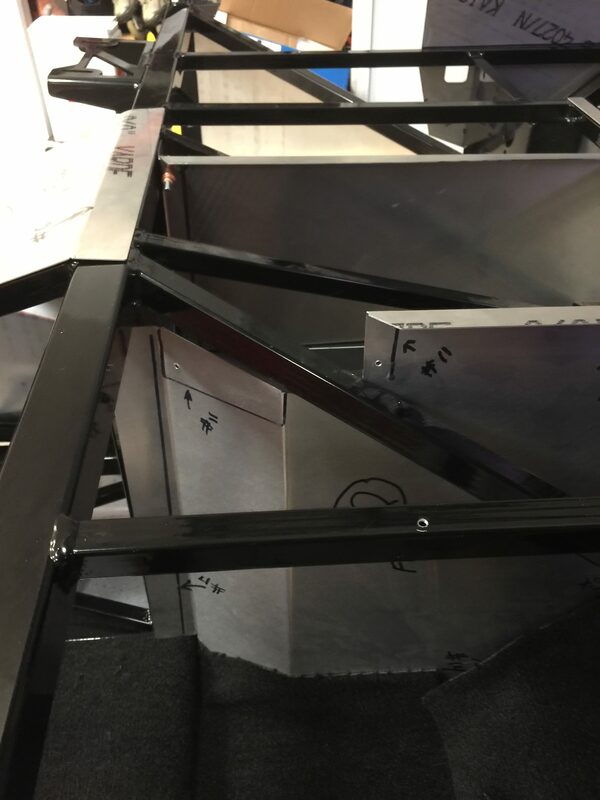 You could weld tabs to the tanks and make mounts to the frame for more security if you wanted. 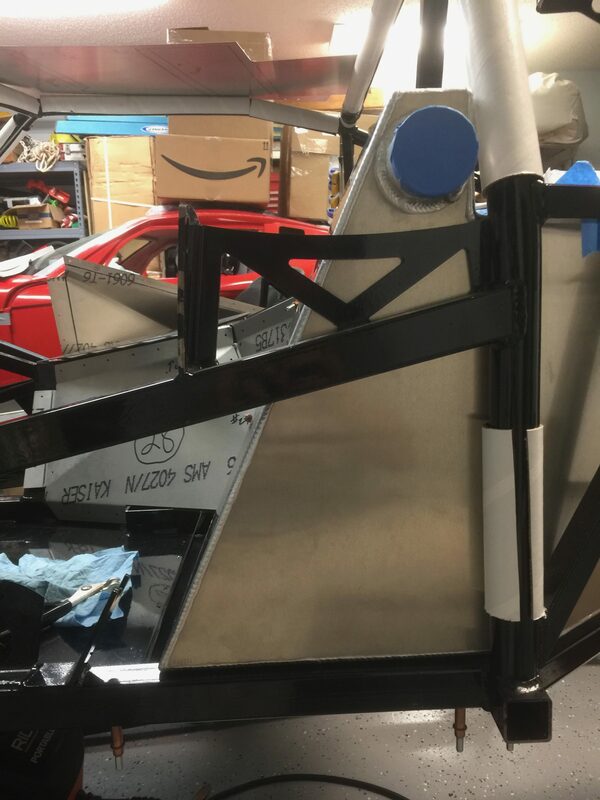 Stig had his filler necks modified to change the angle so that gas would flow without splashing back and stopping the pump. Otherwise he had to pump gas really slowly. He had QRP tanks I think but the filler neck looks the same on the Boyd tanks. Thanks for the heads up, I'll mock it up best as possible and cut the holes in the tunnel to make room for the crossover tube. AN fittings and hose is on order so I have a couple days to play with it. So with the colder weather, I have put coating on hold and have been focusing on electrical. I took advantage of Infinity Box's 17% off and ordered my entire kit, Tino is checking if my EMS will be compatible with his system (so far so good - thanks Tino!! ), and reading up on my AEM Infinity Engine Management System software. Add a programmable EMS, it will be fun they say. Sure, the full manual is 376 pages, the quick start manual is 57 pages, and I picked up a couple recommended books on tuning. Once I get through all the literature I have on hand, AEM offers a 2 day "programming school" to learn how to use their system. Lots of work to add this to Shoeless GTM, but damn if it won't be f'ing sweet when I'm done. My tip on the crossover tube between the tanks......that area will not ever been seen again once you put your tank covers in place and both sides of the aluminum are open to the engine bay, so there's no real reason for that area to be "sealed" at all, and if you cut the holes precisely so the crossover tube fits just right, it will be a real PITA to install and remove the tanks if you ever need to. There is no compliance in an AN hose that big and that short.....so creating some extra clearance in that aluminum panel is going to be a good thing. Thanks for chiming in on this Shane!!! I'm always grateful for the knowledge of those that have come before me and are willing to take time out of their days to help the new guys like me. I have the hose and fittings on order and should be in by the end of the week. It doesn't look like the weather is going to let up for this weekend, so coating is pushed off for another weekend. Plenty of time to mock up and cut clearance for the crossover hose. The past couple days have been filled with ups and downs. 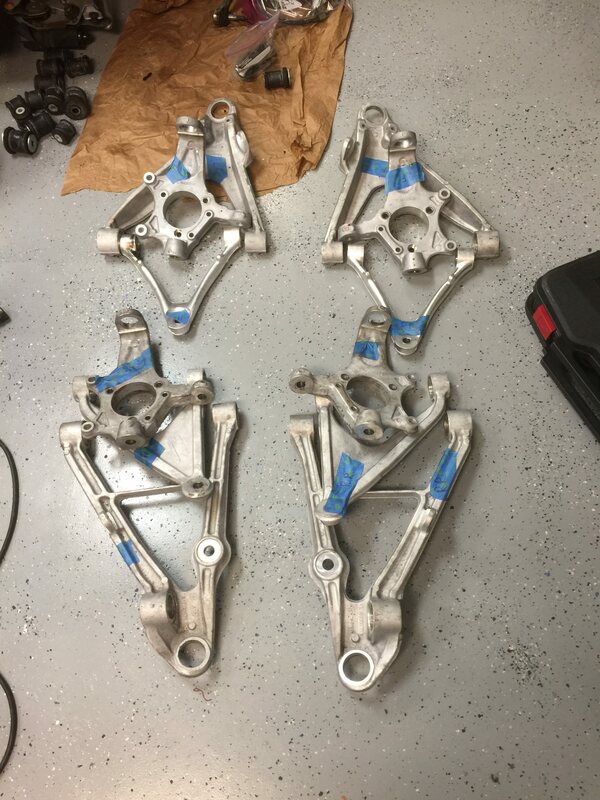 I got back my suspension components back from the powder coater and they turned out EXCELLENT. The color is Silver Hammertone. 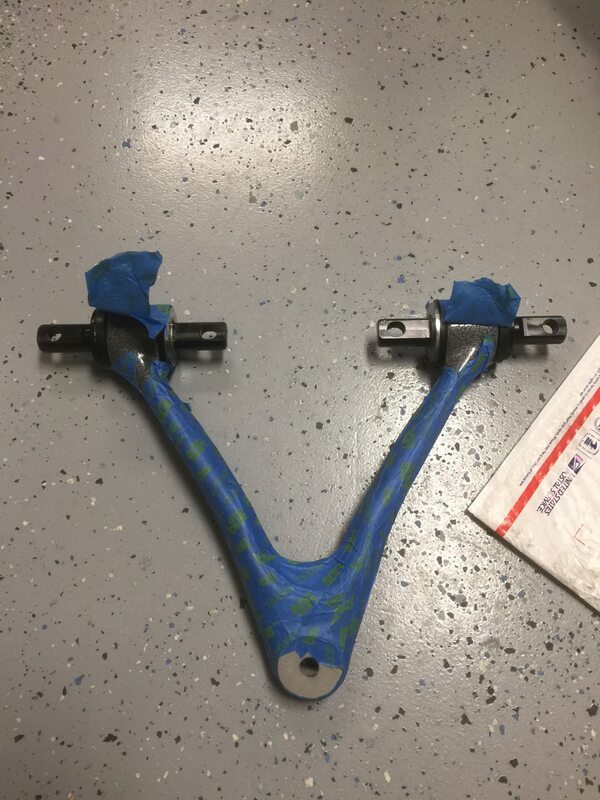 I started to install the PFADT Bushings in the front upper control arms . It took me a bit to get the hang of it with trimming the bushings, greasing, and putting the snap rings in, but I got the hang of it. Then I did a little test fit on the chassis and something was off. The suspension mounts on the driver side seem off. I went back to my instructions on the bushings as one side is thicker than the other, but I installed everything correctly. 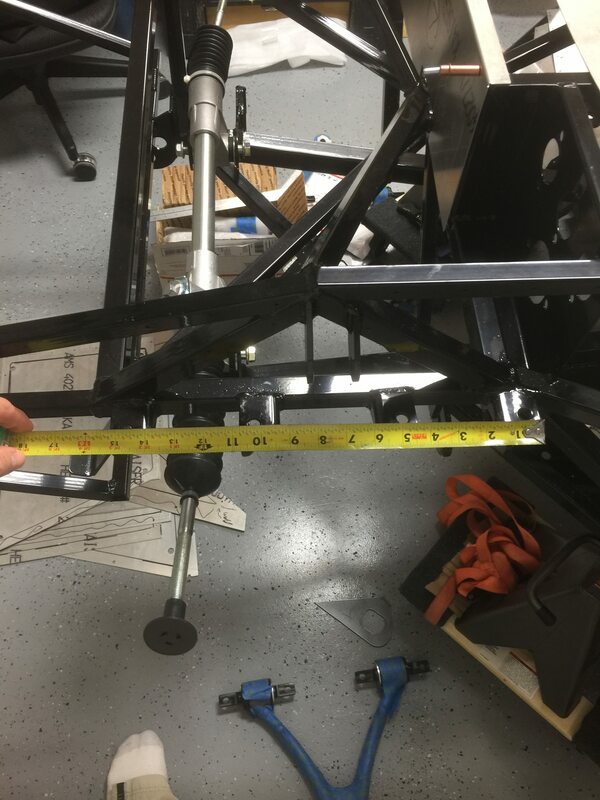 So I went to measure the frame, sure as $hit, the driver side front upper control arm mount is more towards the rear of the car than the passenger side. I measured from the back of the rear mount, to the edge of the left forward mount and the edge of the right forward mount on both sides. Passenger side measurement to the first bracket is 10 15/16 and to the second bracket is 15 3/8. 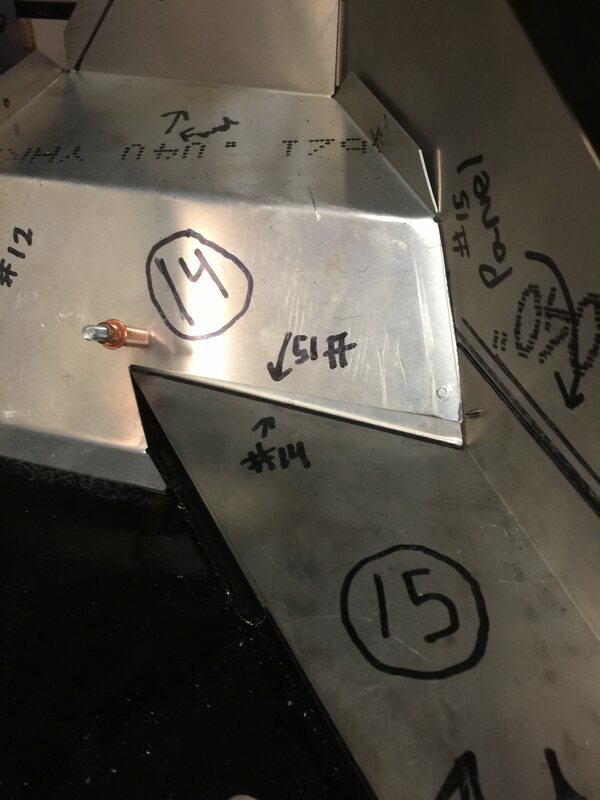 Driver side measurement to the first bracket is 10 3/4 and to the second bracket is 15 1/4. Now I have to make a decision. 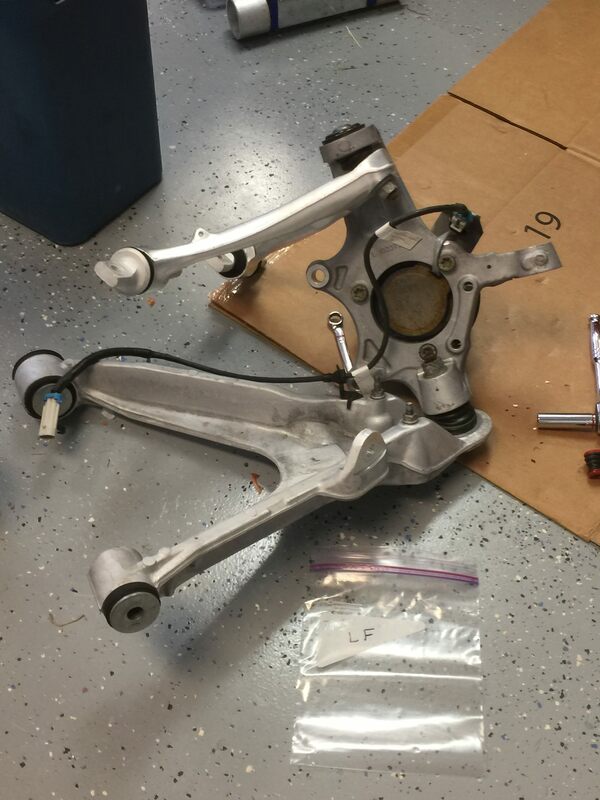 Do I cut the driver side forward upper control arm mounts off, move them forward, and have them re-welded? Or do I switch the bushings around to effectively move the pin more towards the rear in hopes that they line up? I’m thinking switch the bushings around to see if I can make this work without cutting and re-welding. What are your guys thoughts and have you seen this before? Last edited by Shoeless; 01-14-2018 at 10:17 PM.